Throughout the half century, bonnets and hats, apart from sporting styles, were lavishly trimmed, and hair was invariably decorated with flowers, jewels or feathers for evening. Indoor caps were gradually discontinued, by the 1870s worn only, perhaps, with a tea-gown or breakfast jacket and by elderly ladies; servants and country folk wore them well into the 20th century. The variety of millinery styles throughout this period was enormous, and it is only possible to indicate the main shapes, which were dictated by the hairstyles. 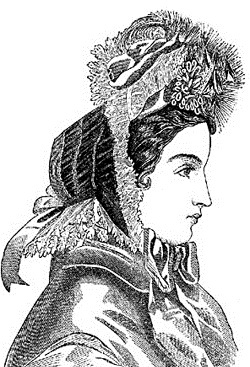 During the 1850s bonnets became shallower and set further back on the head, developing in the early 1860s into the spoon bonnet, which had a narrow brim close to the ears, rising vertically above the forehead in a spoon-shaped curve and sloping down behind to a very small crown, edged with a bavolet at the back. Bonnet strings (or ribbons) were wide, and often not tied but held by a brooch or pin under the chin, occasionally with a tiny bunch of artificial flowers. A curious addition to the bonnet between 1848 and 1864, appropriately called an ugly, was an extra brim resembling the front of a calash, made of half hoops of cane covered with silk and worn round the front as a protection against the sun; when not in use it could be folded flat. 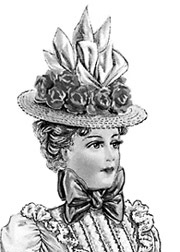 The most romantic-looking hat of the 1850s was a leghorn straw with a very wide brim dipping down at the back and slightly at the front and a high or low crown, trimmed with a lace or tulle veil, ribbons orflowers, or possibly all three; it appears to have been more popular in France and Germany, but was certainly adopted with slight variations in England and America for children’s wear. With the massive arrangement of hair at the back of the head in the late 1860s and early 1870s, bonnets had to be worn further forward, the front curving fronijust above the hair-line to behind the ears where the ribbons were attached, the back cut away to allow the hair to flow freely. At this time hats were also perched on the forehead; a pillbox shape is sometimes referred to as a casquette, a name also applied to a hat following the lines of the Scotch glengarry cap. The Lamballe bonnet or plateau (named after the Princesse de Lamballe) might be classified as a bonnet or hat – worn in the same way as the pill-box, it closely resembled it but was more oval in shape and tied on by strings under the back hair or chignon or, when curved down slightly at the sides, would have ribbons tied in a large bow under the chin. Small-brimmed hats, slightly wider in summer, toques and tiny bonnets set on top of the head above the close, high-dressed hair and fringe, helped to increase height in the late 1870s and 1880s; crowns rose, with a flower-pot shape appearing in the late 1880s. Trimmings, arranged to give a vertical line, could be elaborate and even bizarre: small birds, feathers, feather wings, aigrettes, beetles, flowers, fruit and vegetables intermingled with loops of fancy ribbon, velvet and/or tulle. Fur decorated some winter hats, and toques made of sealskin became very popular. At the same time, for country and sporting activities, plainer and rather masculine hats were in vogue. Boaters, introduced as early as the 1860s, continued to be worn, straight or tilted, into the 20th century. The Fedora felt hat, similar to a Homburg, was named after the heroine in a play by Sardou in which Sarah Bernhardt scored a success. Yachting caps were worn for sailing or at the sea-side. The tam-o’-shanter, for country wear, was a soft, round, flat cap or hat with no brim and a bobble in the centre of the crown; in the 1880s it might be made of velvet, plush, cloth or crochet; a knitted version became usual later. This entry was posted in Victoriana, ~Clothing/Accessories and tagged bonnet, Caps and Hats, clothing, feather, hair, hat, hats, history, Lamballe, Sarah Bernhardt, Shopping, victorian, victoriana. Bookmark the permalink. other blogs. Thanks for sharing this best doc. Yay bing is my world beater aided me to discover this outstanding website! Glad you found us – hope you continue to visit us and find more great information!